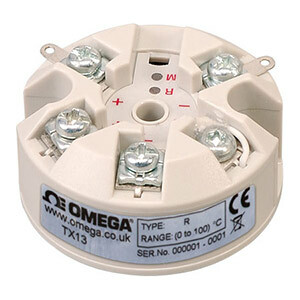 The TX13 is a "smart" and galvanically isolated in head transmitter that accepts thermocouple temperature sensors and converts sensor output over a configured range to a standard industrial (4 to 20 mA) transmission signal. A simple push button operation allows the user to select TC type, burnout direction, select fixed ranges and trim 4 and 20 mA points. The in head transmitter incorporates the latest digital technology to ensure accurate drift-free performance. If required the desired range can be specified at the time of order, removing the need for user configuration. If the range is not specified then the transmitter will be shipped with the default range of 0 to 1000°C (32 to 1832°F) Type K.